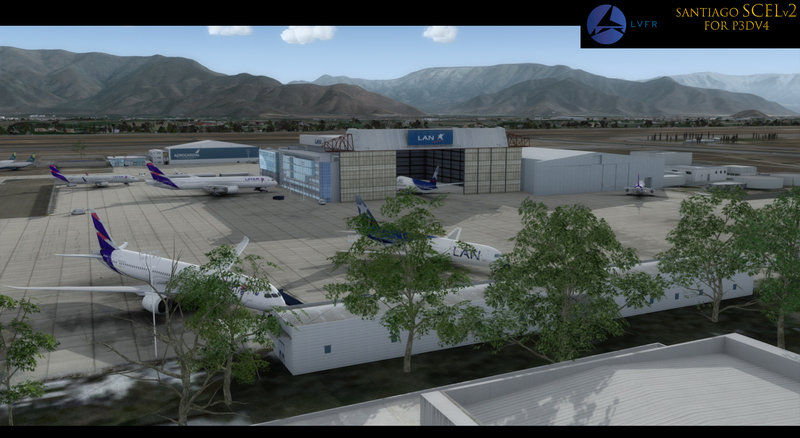 If you previously purchased LATINVFR - LATIN HUB - SANTIAGO CHILE SCEL at simMarket, you are entitled to the special upgrade price of EUR 15.00 only. NOTE: The special upgrade price will be awarded automatically, therefore you must be logged into your same account used to purchase the previous version! If in doubt contact simMarket support first! NO REFUNDS GIVEN! 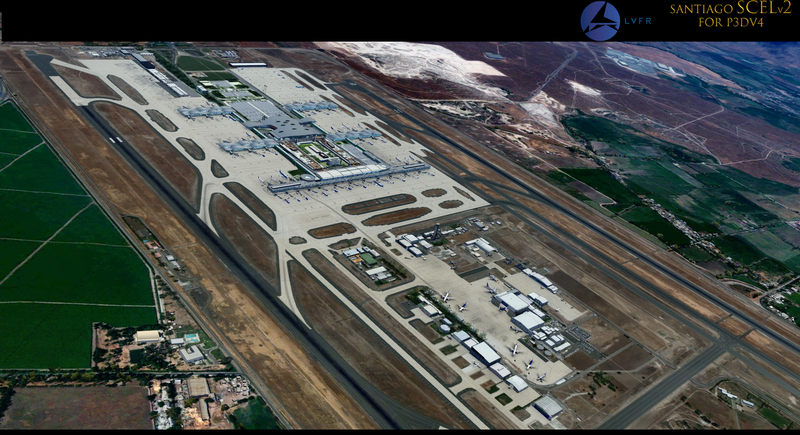 Comodoro Arturo Merino Benítez International Airport is Chile's main airport, and one of South America's most important. 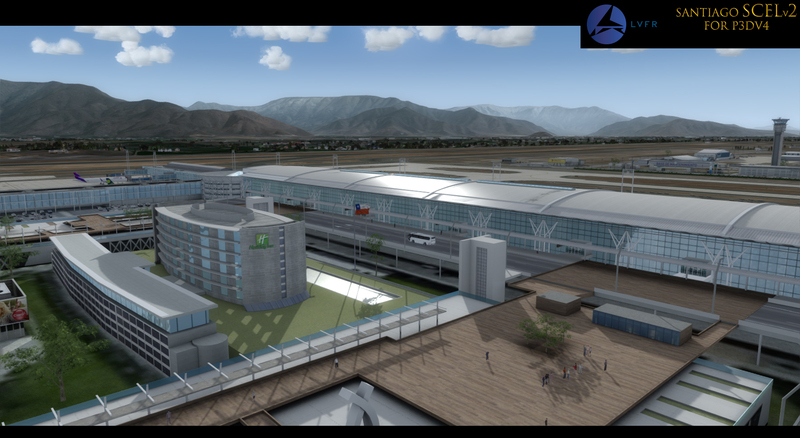 Handling more than 20 million passengers a year this airport is home to many important airlines and has dozens of international airlines with flights to other countries in South America, North America, Europe and Asia. 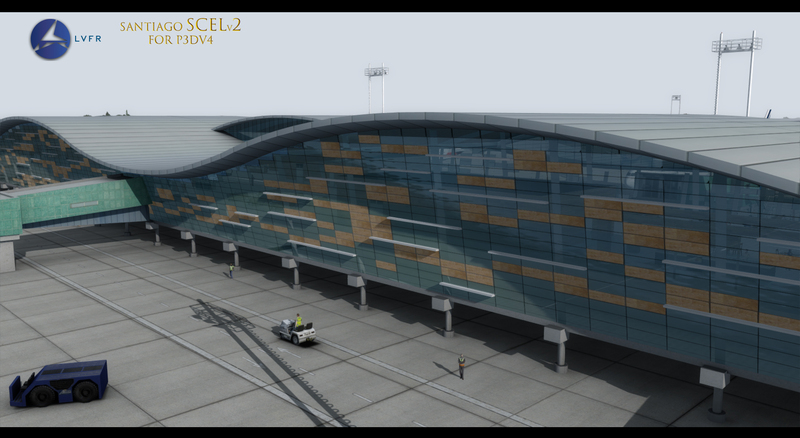 This new version of SCEL is completely built from scratch with no elements from the previous version used, nonetheless we extend a curtesy lower cost update fee to ALL customers of v1. 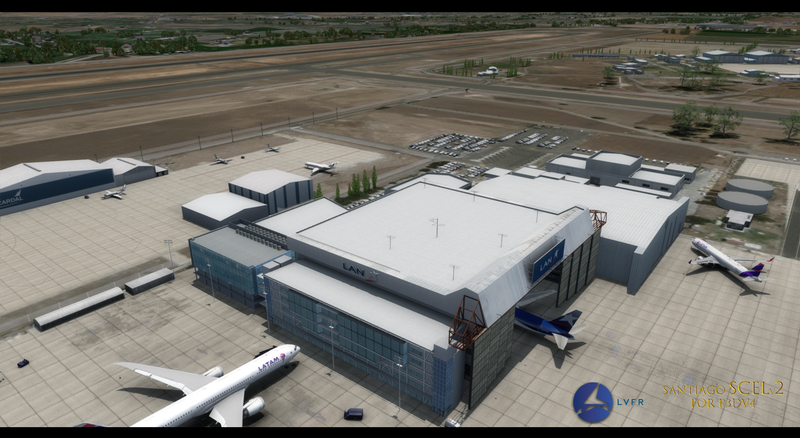 We at LVFR did our best to recreate the airport as it is planned to be completed in 2020 with its new international terminal. 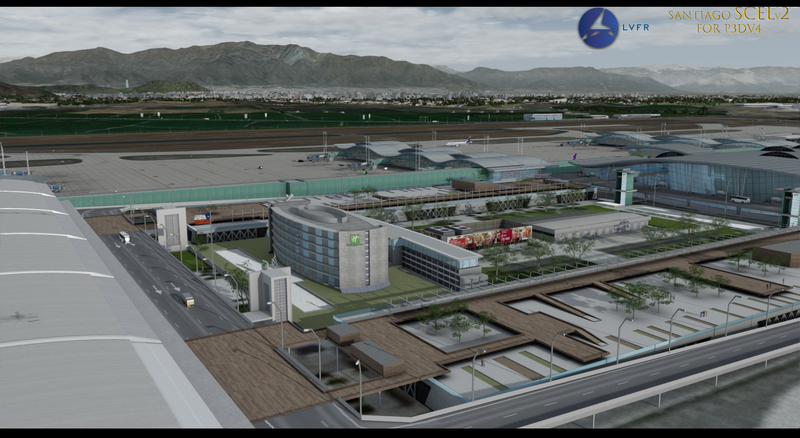 Design was based on the master plan and its current state of construction. 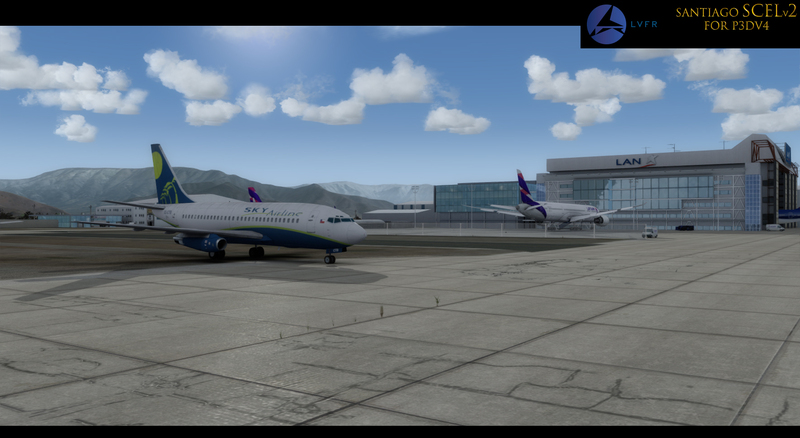 For this scenery we REQUIRE you install SODE before installing this scenery as SODE will control the jetways, all runway lights and windsocks. 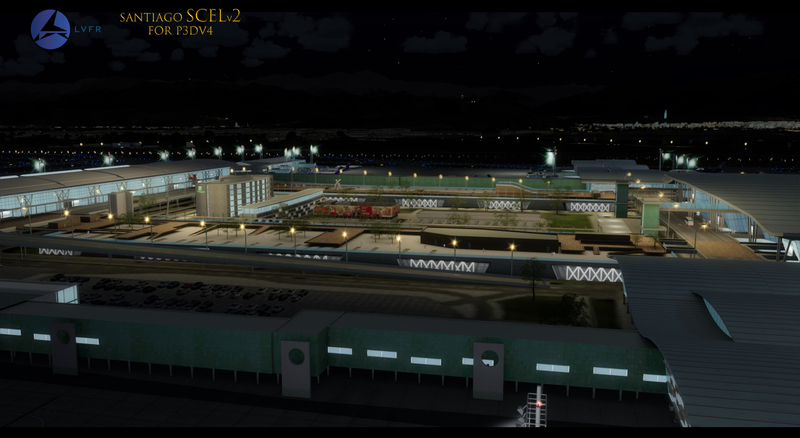 Highly detailed terminal and airport buildings. 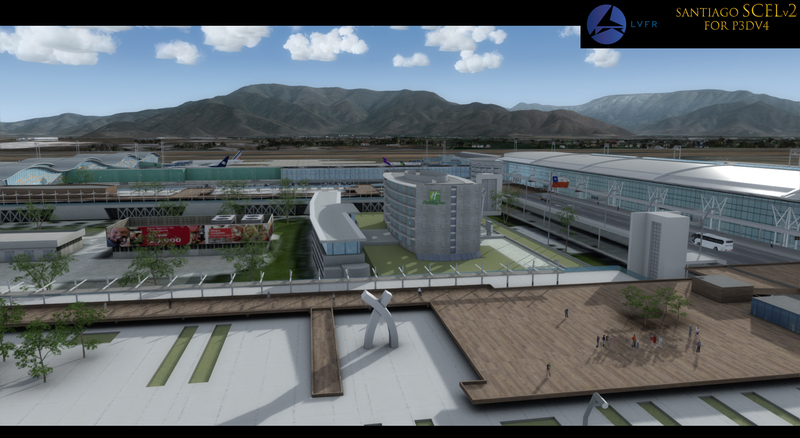 New international terminal done according to master plan and current work, which is expected to finish in 2020. 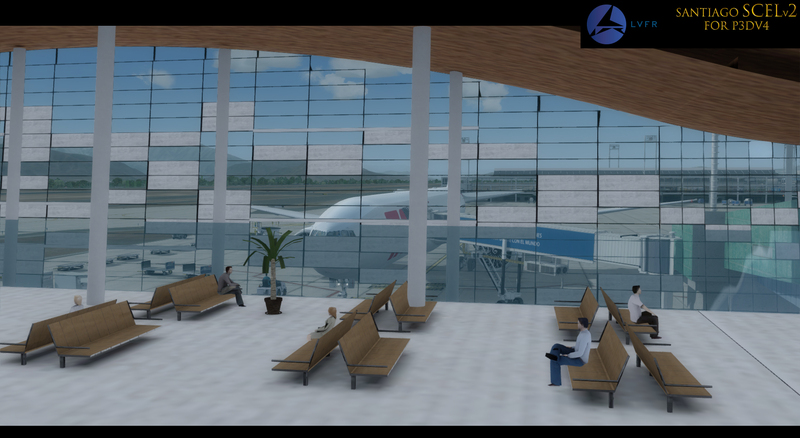 Interior modeling on all passenger terminals, with furniture/static humans. 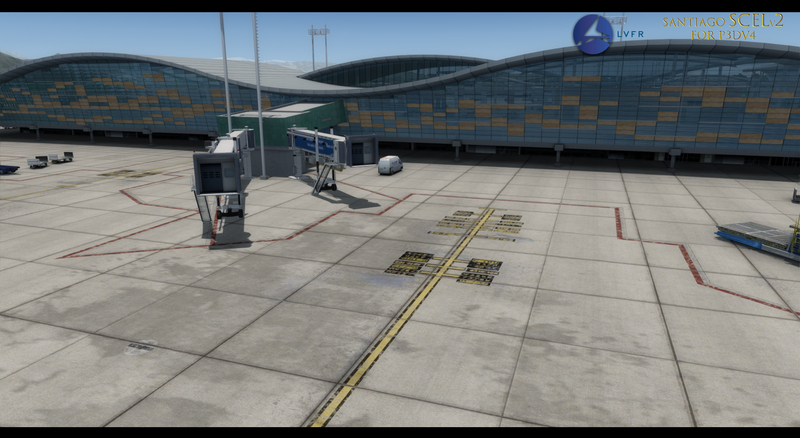 Highly realistic animated SODE jetways. 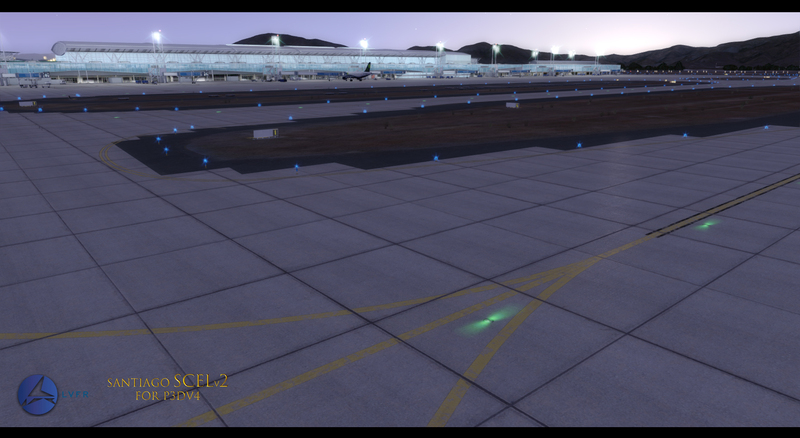 Runway lights controlled by SODE, turn on during low visibility/rain automatically. Highly detailed ground polygons, with different shaders and effects. 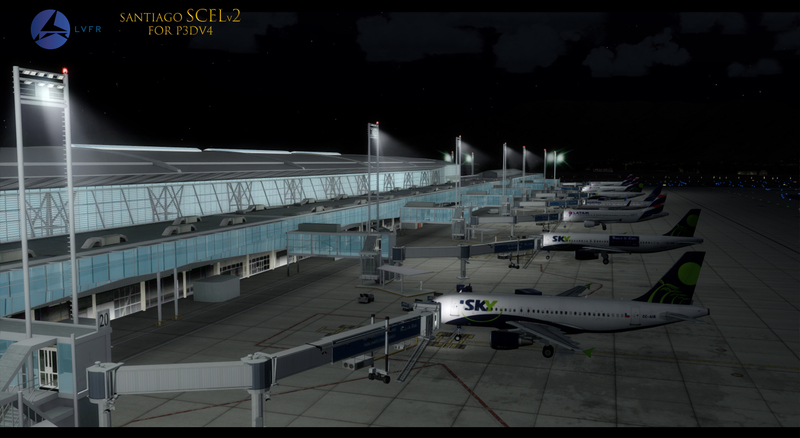 Excellent night effects and dynamic lights. 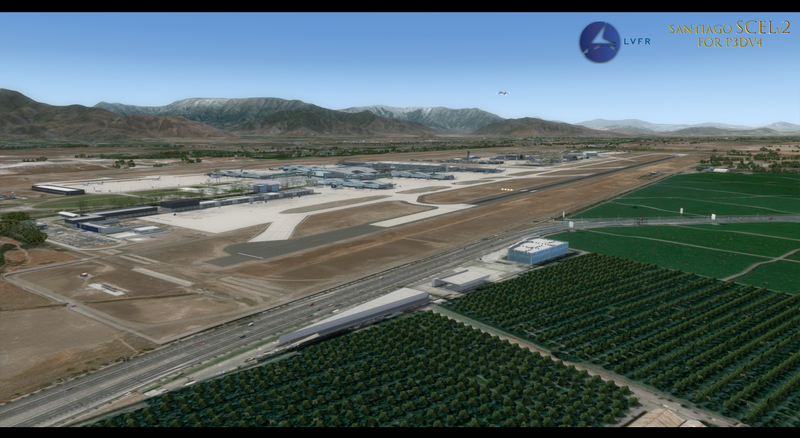 Photo scenery coverage includes airport vicinity and nearby mountains. 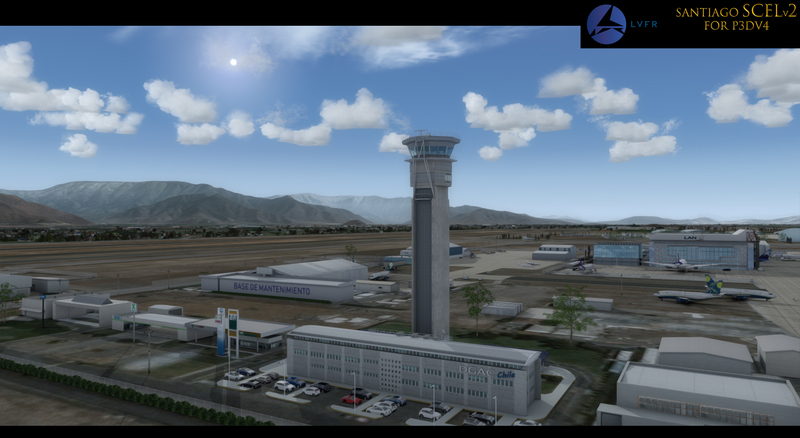 Extremely detailed terrain mesh for the region of Santiago, and nearby Andes mountains for highly detailed approach immersion. 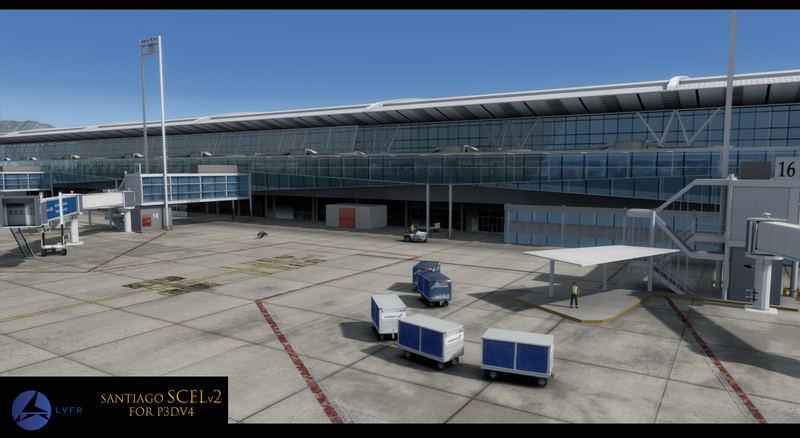 Great scenery, it its very nice on textures and similities to the real airport with the future terminals included... Now the only thing to be improved, are te FPS comsumption that are a little high since is a big airport now and with better textures. Very nice scenery with nice levels of detail. 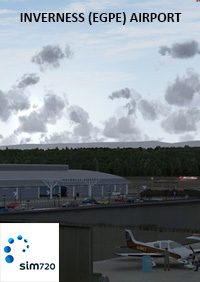 However, the scenery does not accurately simulate SCEL as stand 10-14 should be east facing and stand 15 south-east facing, yet in the LatinVFR rendition they are all south facing. 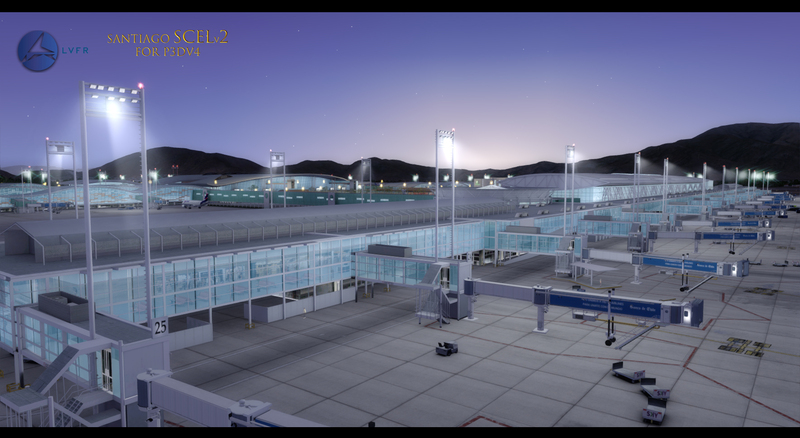 Hopefully they will rectify this issue in upcoming updates, as I do enjoy flying into this airport, especially from Europe. Further to my previous comment. With the update to incorporate PBR, this is outstanding. IMHO the best Latin's scenery to date! 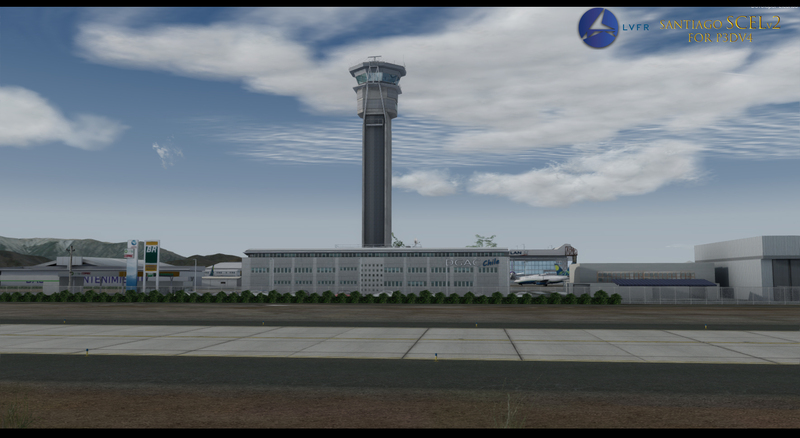 This airport is very detailed and performs very well even with all P3Dv4 features enabled such as DL, dynamic reflections etc. 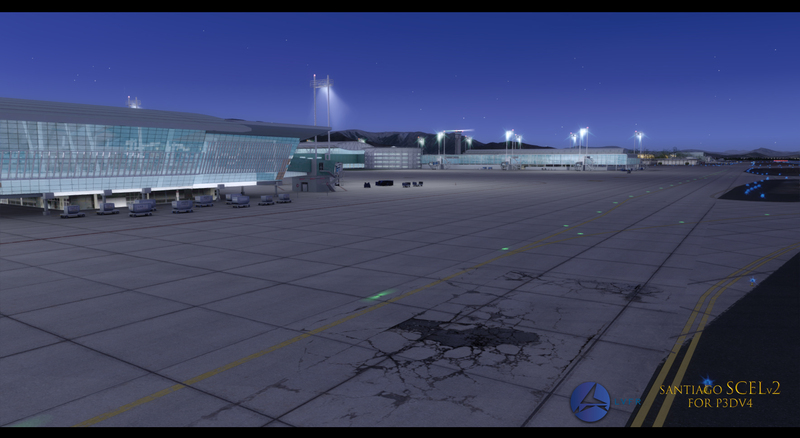 All buildings/terminals have interiors, this looks amazing especially at night. Very, very, very good! 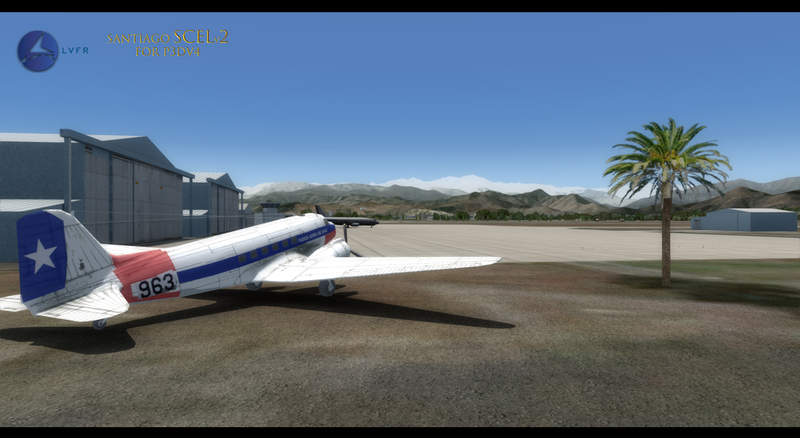 I always thought this was one of the best Latin VFR offerings. 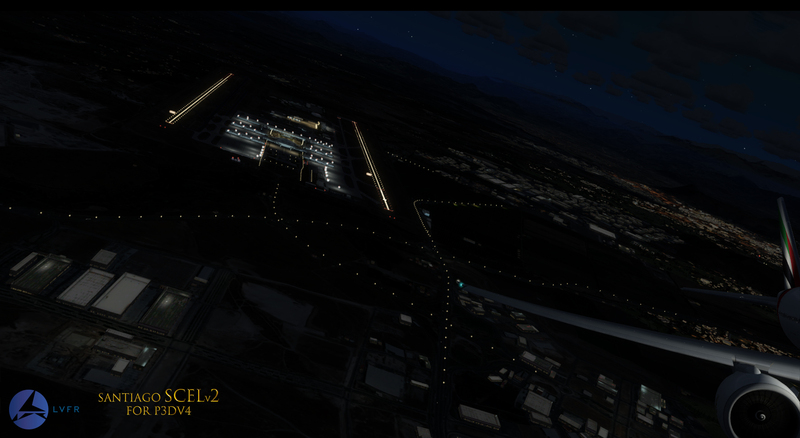 It's now even better in P3D V4. 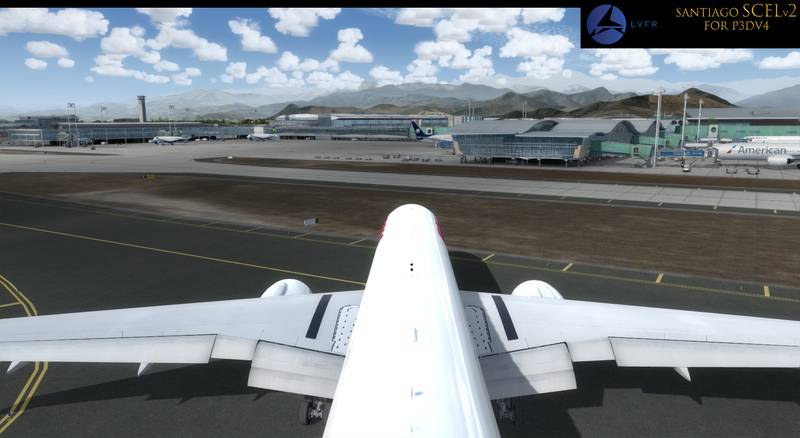 Great scenic approaches and departures with the Andes all around. 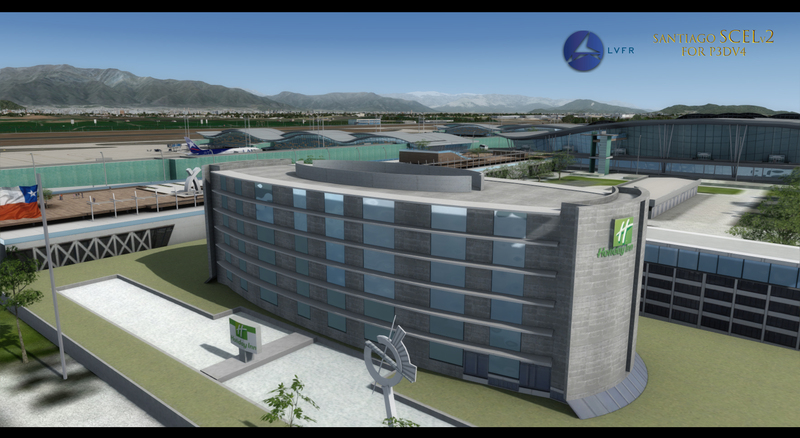 The airport itself is done extremely well. 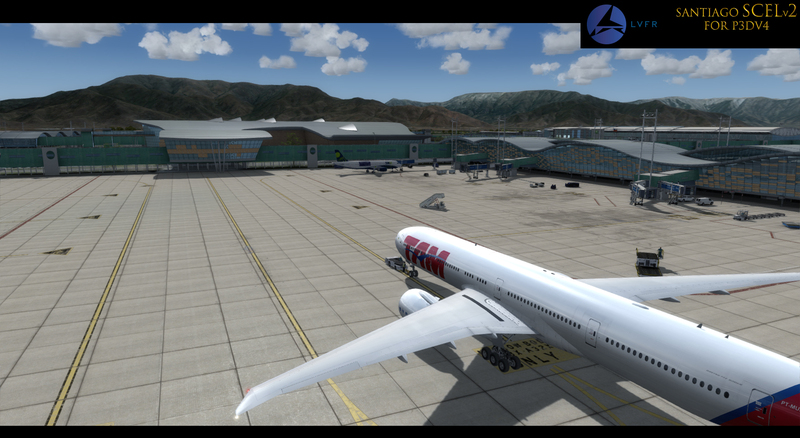 I highly recommend you pair it with ORBX South America LC. Very very surprised how good this product was. Well done LatinVFR. 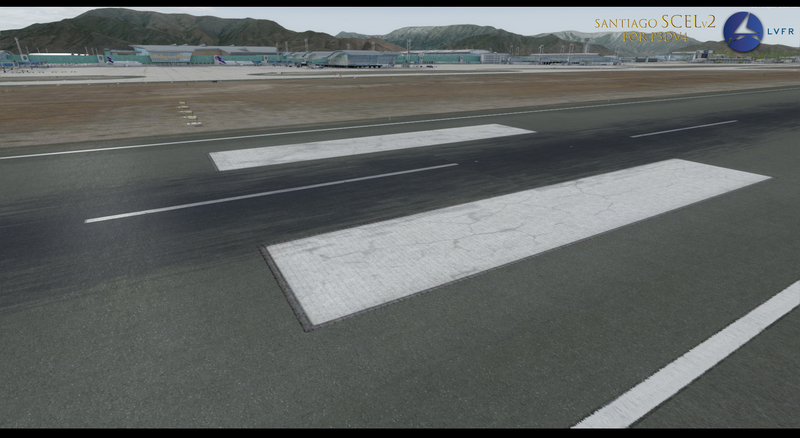 A big improvement for LatinVFR from their previous sceneries. 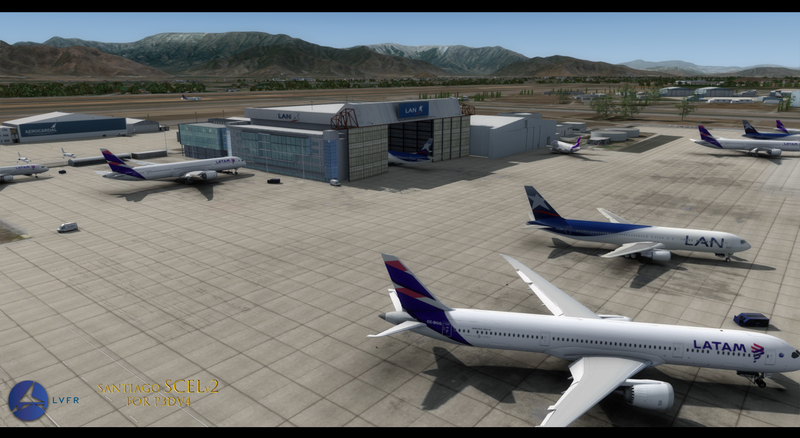 Back in the FSX days, I had given up on them due to lack of quality. 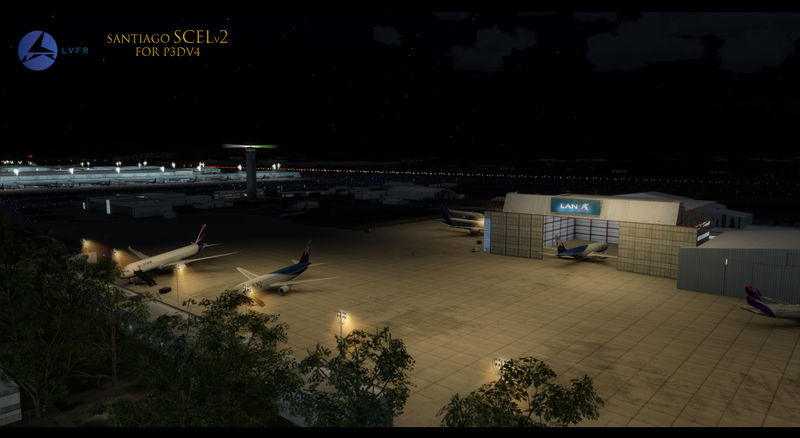 This airport is much improved and a great add-on for an under-represented region of the sim. The AFCAD file is also very good quality as well for AI users. Unfortunately, there are a few reason why I can't give this scenery more stars. 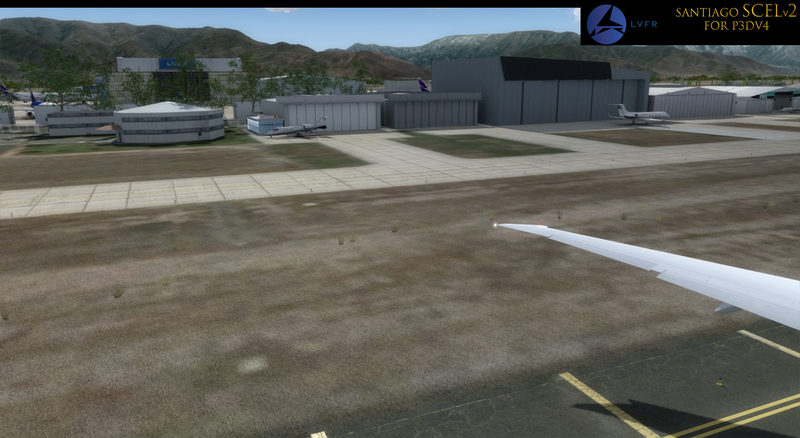 - After a couple minutes flying around I had a CTD. 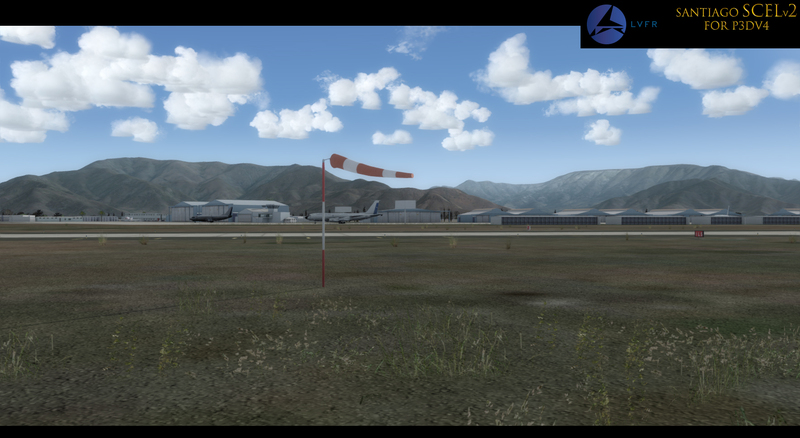 Checked P3D error log file and saw there are several textures missing from this scenery. Developers should at a very minimum check the content error log. It was put there by LM for a reason. 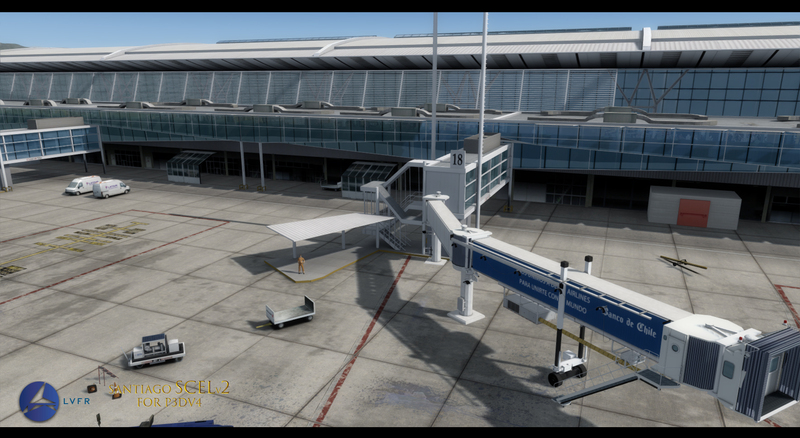 - The modeling of the main terminal has a couple issues where the main roadway is missing and the vehicles are basically hovering over the wooden textures below. Should have been spotted in beta testing really. - The satelite foto (extended one) has some pretty strong color distortion towards the edges. This part should have been left out. 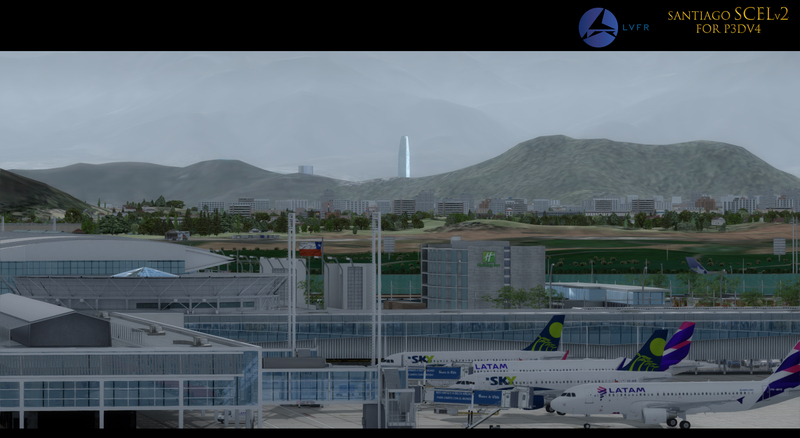 The control panel allows you to de-select the extended area foto ground, but this then leaves you with a very sharp edge for the airport foto ground that does not blend into the surround terrain and landclass (ORBX-FTX South America LC). Would be great to have a blend option for users of FTX LC and Vector products since these add-ons are quite popular. Very good job; well, definately LVFR has increased its quality level bar; more - and what I apprecietae most -, is the quick response to customer enquires. I exchanged some point of view, getting fast answers. 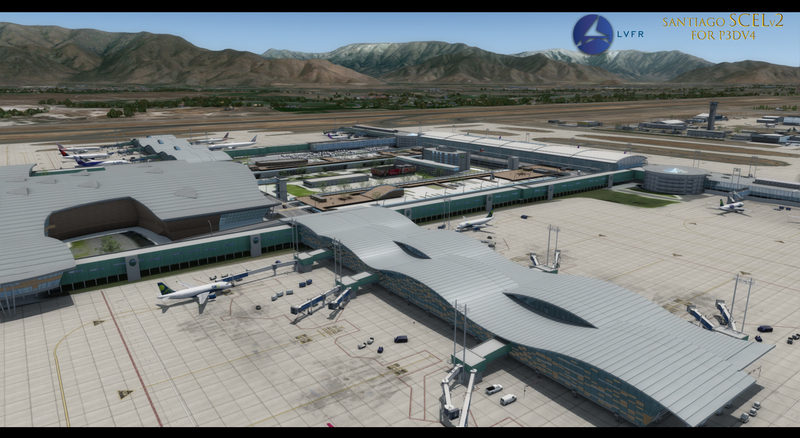 Another important feature is the chance the simmer has to include or exclude the airport outskirts by means of the Scenery Configurator - such as for Baltimore, Miami and some recent LVFR add-on -. 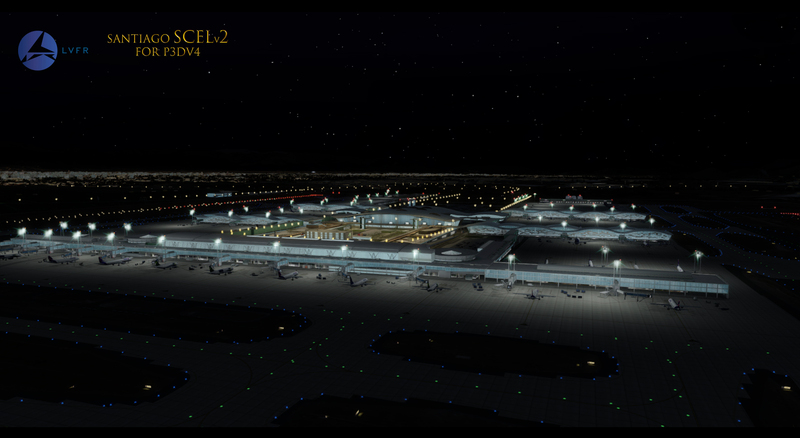 Actually, I don't like photoscenery at all, apart from the spectacular new ORBX products. 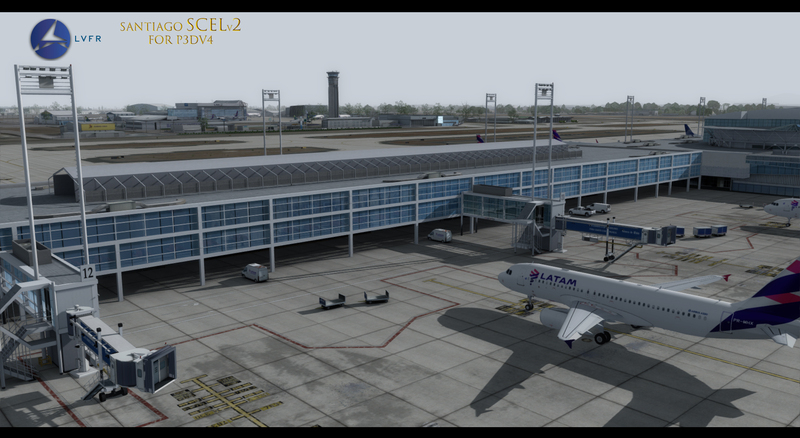 Hope LVFR goes on updating South American airports, after FTX Orbx published their South America Open_LC. nals have interiors, this looks amazing especially at night. Very, very, very good! 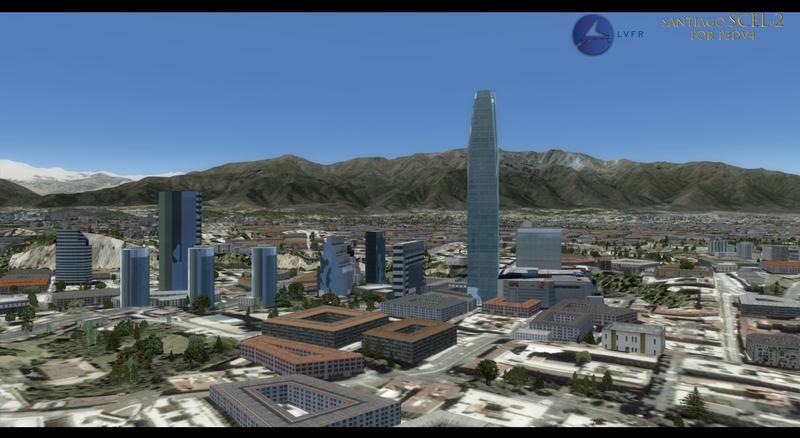 ed region of the sim. 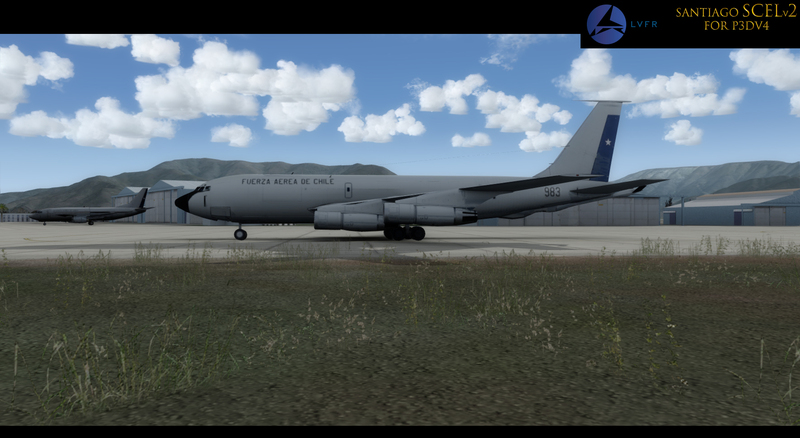 The AFCAD file is also very good quality as well for AI users. 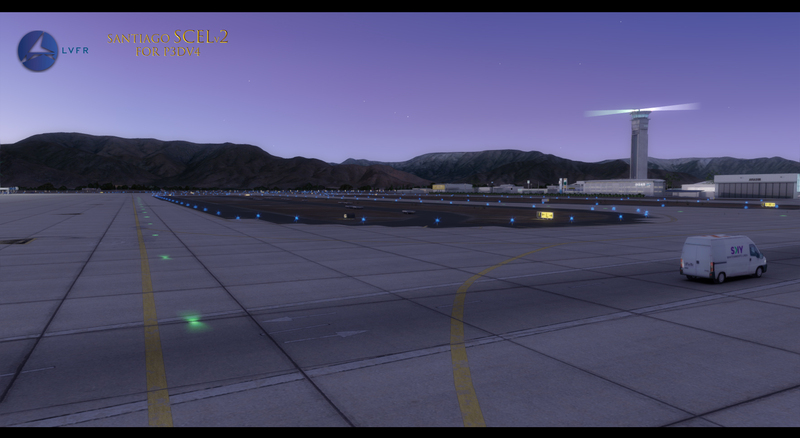 Unfortunately, there are a few reason why I can't give this scenery more stars. 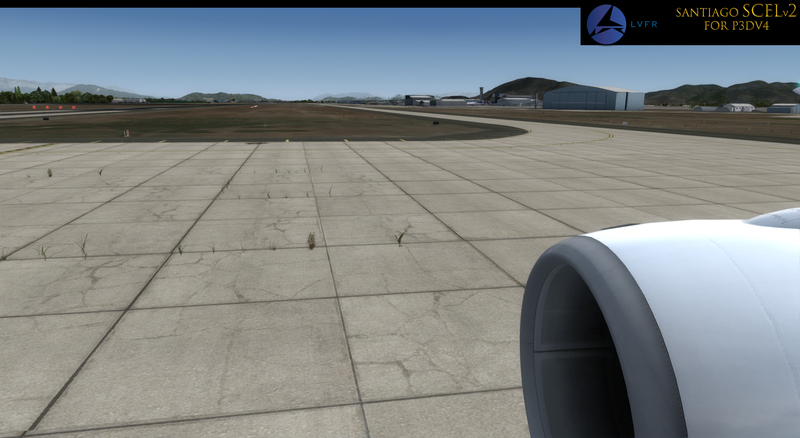 - After a couple minutes flying around I had a CTD. 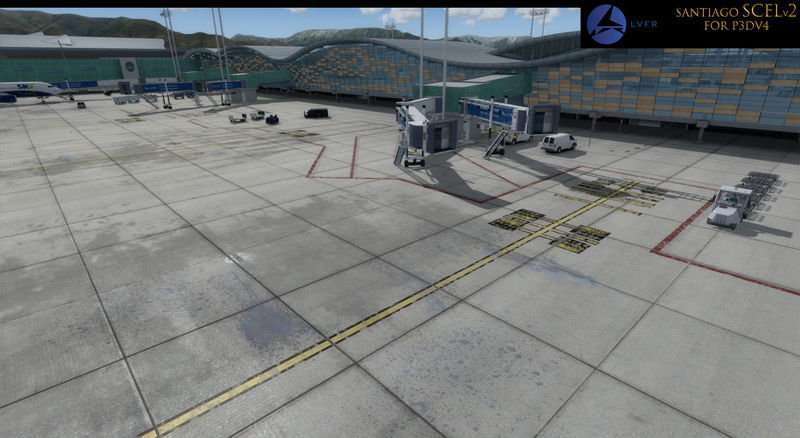 Checked P3D error log file and saw there are several textures missing from this scenery. Developers should at a very minimum check the content error log. It was put there by LM for a reason. 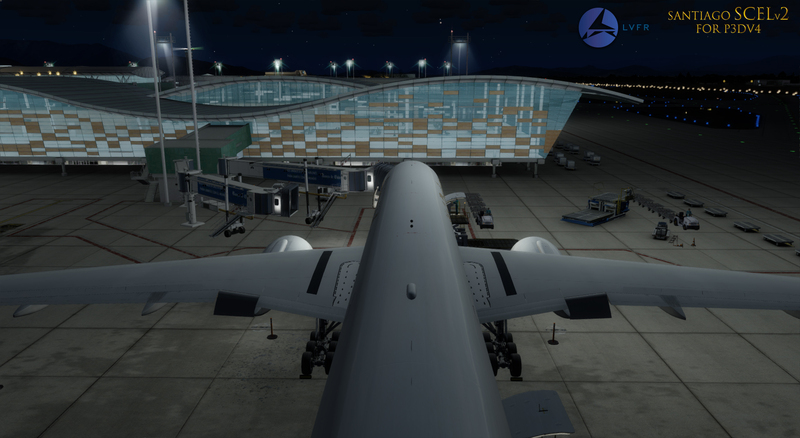 - The modeling of the main terminal has a couple issues where the main roadway is missing and the vehicles are basically hovering over the wooden textures below. Should have been spotted in beta testing really. 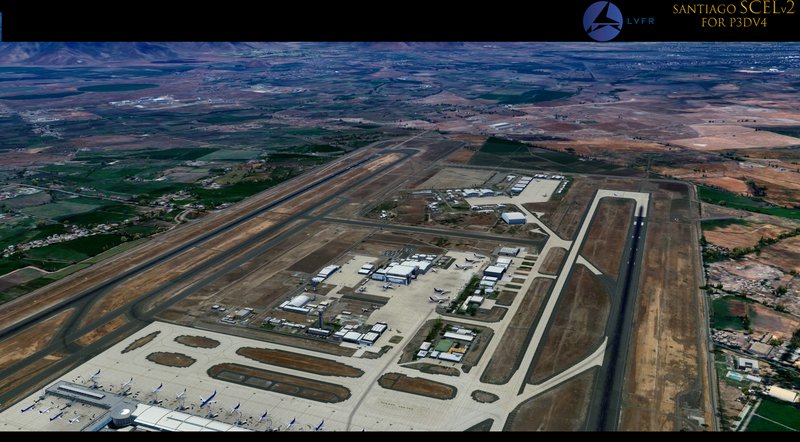 - The satelite foto (extended one) has some pretty strong color distortion towards the edges. This part should have been left out. 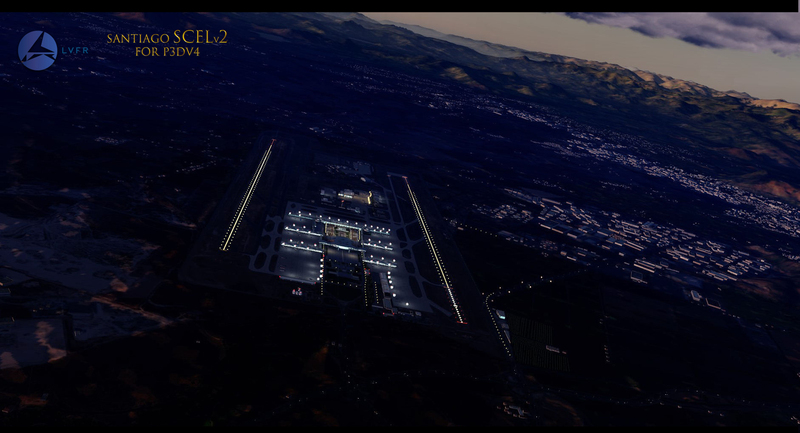 The control panel allows you to de-select the extended area foto ground, but this then leaves you with a very sharp edge for the airport foto ground that does not blend into the surround terrain and landclass (ORBX-FTX South America LC). Would be great to have a blend option for users of FTX LC and Vector products since these add-ons are quite popular.  Very good job; well, definately LVFR has increased its quality level bar; more - and what I apprecietae most -, is the quick response to customer enquires. I exchanged some point of view, getting fast answers. 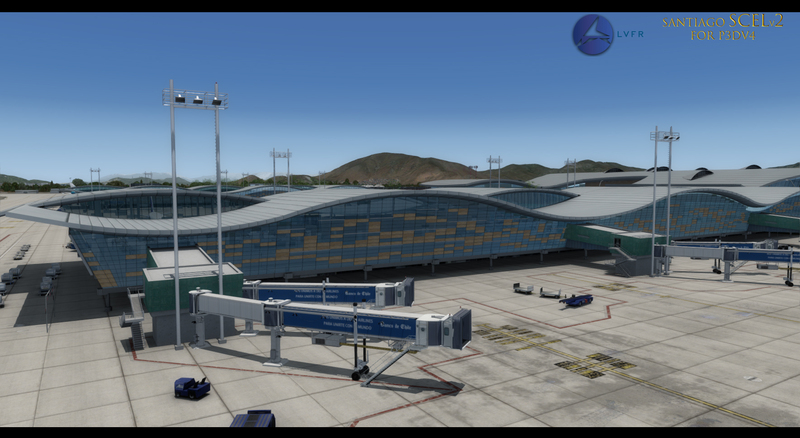 Another important feature is the chance the simmer has to include or exclude the airport outskirts by means of the Scenery Configurator - such as for Baltimore, Miami and some recent LVFR add-on -. 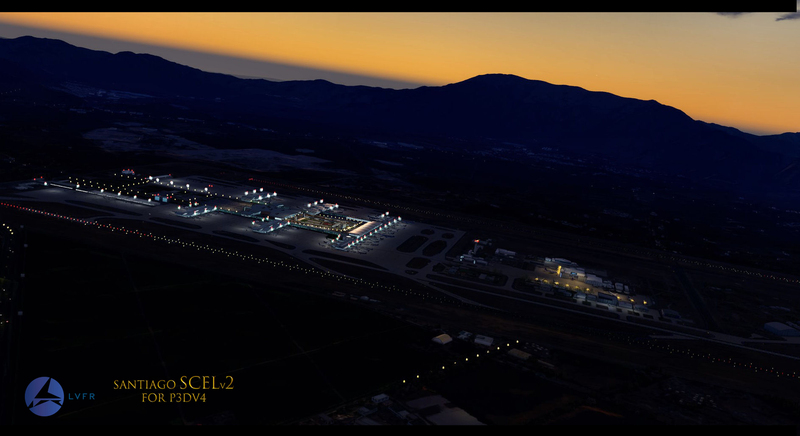 Actually, I don't like photoscenery at all, apart from the spectacular new ORBX products. 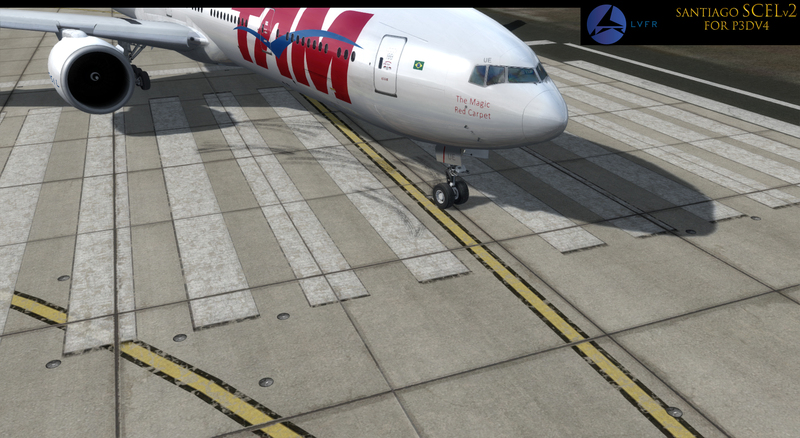 Hope LVFR goes on updating South American airports, after FTX Orbx published their South America Open_LC.